Because we make our shades in the USA (Smyrna, Georgia) we can offer affordable, attractive customizing for even small quantity orders (12+). You can choose from a wide selection of flame-retardant fabrics and trims including fabric edging, braid, scallop edging or fringe. You can also choose your own custom finish and colors to match your décor. Logos or Hand-painted designs to further accent your lamp are also available. 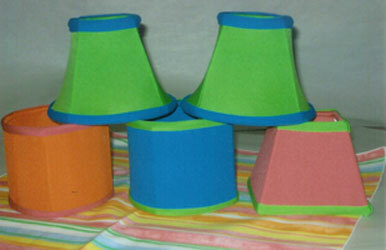 Sewing techniques such as pleating, accent fabric edging or accent color pleats further add to the individuality of your custom lamps. Accent medallions and theme cut-outs are just more of the options we offer to help make the perfect lamp shade for each customer. Below you can see examples of custom shades made right here in Smyrna! Contact us at 770-423-1156 for more information and pricing. Shown below are some examples of ways we have customized our products to offer our customers the unique piece they were looking for. 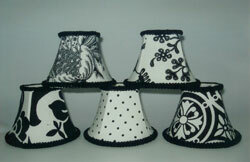 The black and white patterned shades were made of the same fabrics as the assorted linens for a special event. The event designer sent us the fabric which we flame-retarded and made into shades for the table candle lamps. The multi bright color shades were done for an event with these bright, fun colors! All shade fabrics tie in to the stripe linen design. Handpainted seascape scene by TDI to blend with South Florida design and china pattern. This lampshade is lined with peach satin to enhance the flattering glow of candelight. Banquette upholstery fabric was used as trimming on the lampshade to tie the tabletop design to the other restaurant decor. Lamp plated in satin nickel finish to match customer’s pepper grinder. Mohonk Mountain House sent us their turn of the century antique oil lamp and we remade it to use a current 30-hour fuel cell as well as hold a flower vase & table number for their banquet tables. This renowned National Historic property kept true to their heritage by having us update their original lighting design. Custom handpainted lamp base to match granite sample furnished by designer.